In 2002 Craig Venter announced that Celera had sequenced his personal genome, not a composite as originally claimed. 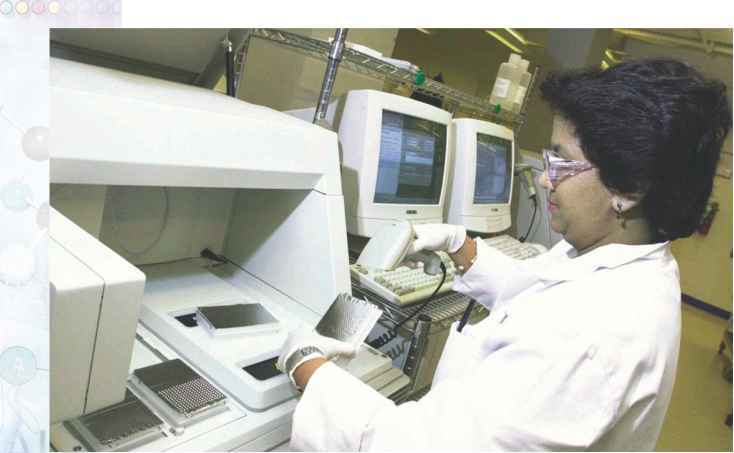 A Celera Genomics technician inputs DNA samples while the DNA sequencer machine searches and catalogs proteins. should be patented. Indeed, this debate was the reason that Watson resigned as the first director of the NIH Human Genome Project program in 1992. Watson's position was opposed by many biotechnology companies, which hoped to recover the cost of their genome research and began patenting short segments of sequenced DNA without any idea as to their function. As of 2000, the U.S. Patent and Trademark Office (PTO) changed its policy, and began granting patents only to genes that have been identified, rather than just the random sequenced fragments. The data that flow from genome sequencing will be an invaluable scientific resource, particularly in the area of developing new medical treatments, but its use will be restricted if individual organizations can claim exclusive use rights to large segments of it. It is thus clear that debate on the patenting of genes will continue for years to come. At present much of data from genome research are available to scientists and other interested parties. The data generated by participants in the Bermuda Principles agreement can be accessed on-line at the National Center for Biotechnology Information (NCBI) Web site, at <www.ncbi.nlm.nih .gov/genome/guide/human>. The International Human Genome Consortium Web site provides a current list of genome sites that offer links to most genome databases at <www.ensembl.org/genome/central>. Information about all the genomes that have been sequenced, as well as information on the sequencing of cancer genes, can be found on the Internet at <http://www .ncbi.nlm.nih.gov>.